But Lani Kai was much lesser known as a singer. His clear tenor was well suited to both traditional Hawaiian-language songs and the English languagehapa-haole standards. You’ll recall from the earlier post about The Surfers that MCA was the parent company of both Decca Records and Paramount. Perhaps to capitalize on his success on TV in ABC-Paramount‘s “Adventures,” in the early 1960s Decca released “Island Love Songs,” an album of Hawaiian songs by Lani Kai using local Hawai’i musicians arranged and conducted by Chick Floyd. Chick’s arrangements – a combination of the more traditional ‘ukulele and steel guitars and the burgeoning exotica movement which incorporated flutes and Latin percussion – suited Lani’s larger than life personality which could not help but translate to his vocal style. Like the “Hawaii Calls” radio broadcast which was still popular during this period, the album featured the dual steel guitars of Barney Isaacs and Danny Stewart. There isn’t a single song on this album not worth hearing again and again. So it was difficult to choose something to share with you. Ultimately, I chose the swinging “Seven Days In Waikiki,” a Jack Pitman composition seldom performed then or now, and “Moana,” another seldom heard gem from the pen of Lani’s beach boy friend, Alex Kaeck of the vocal group The Invitations. Lani went on to record only one other album in his lifetime – the ill-conceived Disco-oriented “The Many Sides of Lani Kai,” an album comprised solely of Jerry Marcellino originals, in 1979. 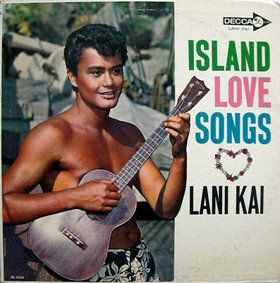 But with “Island Love Songs,“ Lani left an indelible footprint on Hawaiian music history for the lucky few who can locate a copy of this long out-of-print LP. Click here to listen to this set of songs from Lani Kai.